The Cuisinart Food Dehydrator dries your favorite meats and fruits for healthier and delicious snacks. It preserves food naturally without additives or preservatives. The powerful 620-watt motorized fan has a top vent that allows heat to circulate evenly and efficiently, for faster drying and excellent results. The food dehydrator features adjustable thermostat that allows for different temperatures, depending on the type of food that's being dried. With ample space to accommodate large quantities of food, the dehydrator has five interlocking trays that stack on top of one another for easy placement. It makes it easy to create nutritious, delicious, dried snacks like meat jerky, fruit roll-ups, and veggie chips. 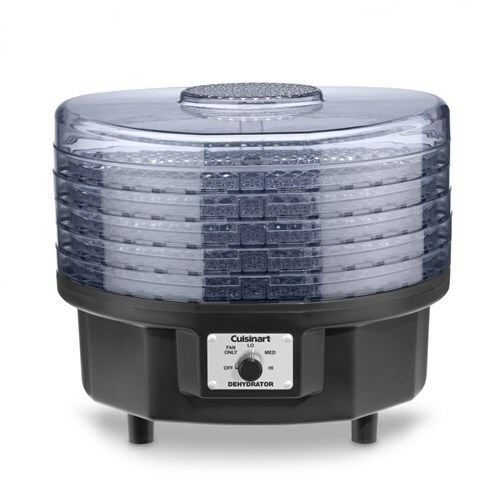 The Cuisinart Food Dehydrator has many exciting features for users of all types. You can extend the lifetime of your Cuisinart Food Dehydrator with the purchase of a FactoryOutletStore Factory Protection Plan. 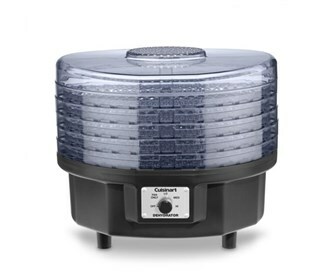 See the Cuisinart Food Dehydrator gallery images above for more product views. The Cuisinart Food Dehydrator is sold as a Brand New Unopened Item.